Silver Sands is the island's most popular windsurfing location. Visitors can expect challenging yet forgiving conditions, set up by a reef that lies 820ft (250m) offshore. It provides a steady three to seven foot swell (1-2m), though waves can reach up to 16ft (5m) on some days. 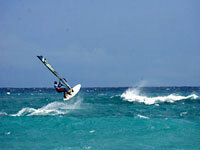 Mid-November is the best time for windsurfing in Barbados, when moderate trade winds blow consistently over the shores.